This is my entry in the Classic Movie History Project Blogathon co-hosted by Movies Silently, Silver Screenings and Once Upon a Screen. There are a whole raft of topics for this blogathon. Today's entry is for the "Before They Were Stars" category. 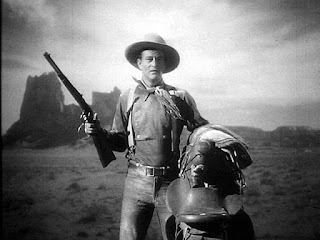 I recently read Scott Eyman's opus on John Wayne, John Wayne: The Life and Legend. A great biography, if you like Wayne, but it had a tendency to be tedious on occasion. 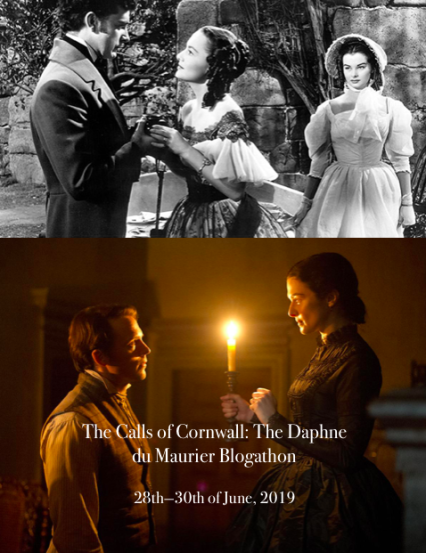 Still, it served as a good reference for this post, since my prior knowledge of the Duke was limited to only what movies I had seen, and the occasional tidbit of information (like the fact that his real name was "Marion"). I am currently reading American Titan: Searching for John Wayne by Marc Eliot. Both of these were referred to extensively for this post. For purposes of this blog entry I chose to delineate the "before stardom" portion of his life as everything that occurred before his role in Stagecoach. While it is true he had a career in the movies before this film (Eliot sets the number at 81, but he is including anything in which Wayne can be identified as an actor, which would include some 20 or so walk-on parts which may or may not have included any dialogue), I personally consider his coming in to true stardom and recognition as "The Ringo Kid" in Stagecoach. Feel free to argue this point, but it is where I stand on it. Wayne was born in Winterset, Iowa as Marion Robert Morrison on May 26, 1907. That's the name he was given at birth. The "Robert" was changed to either "Michael" or "Mitchell" (sources vary), after the birth of his brother, whom the folks wanted to name "Robert". (A note: I didn't know you could do that after the fact, but apparently you could, maybe still can for all I know). Morrison was named after his paternal great-grandfather, Robert, a political refugee from Ireland, and his grandfather Marion. "Marion" was not always a female name in olden times; it had been considered a valid male name since medieval times. Morrison and his father lived in Glendale, where his father attempted once more to be a productive citizen. Morrison went to school where he excelled especially in sports. According to Eliot, in 1925, Morrison's high school won the state championship, not only going undefeated, but no opponent in the regular season even scored a point. 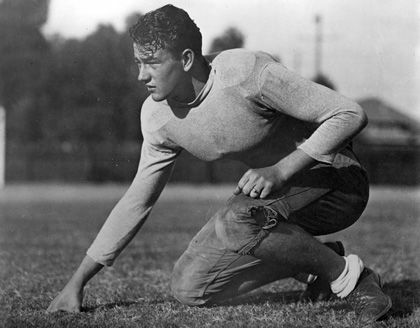 Morrison graduated high school and garnered a football scholarship at USC. But it wasn't a full scholarship, so he took on various part time jobs. Some of the jobs he did were working as a muscleman doing various odd jobs on the movie lots in nearby Hollywood. He also got, as a result of his USC football team exposure, a few on camera appearances as an extra, mainly as one of the football team in such movies as Brown of Harvard, The Drop-Kick, and The Draw-Back. His first appearance in a John Ford film, Mother Machree, brought him to the attention of Ford, who saw in Morrison something that needed to be drawn out. Over the next couple of years, Morrison got various bit parts, which helped him earn some money, usually enough to struggle by on, but not much better. His first real break came in 1931 when, not John Ford, but Raoul Walsh, gave him his first big break and cast him in the lead role of The Big Trail. Only one problem. Morrison couldn't act. The producers objected to Walsh's choice, but he was adamant that Morrison was the one to play "Breck Coleman". One attempt to dissuade Walsh was that Morrison's name was too long for the marquee, so they hashed out a name change and eventually came up with "John Wayne". 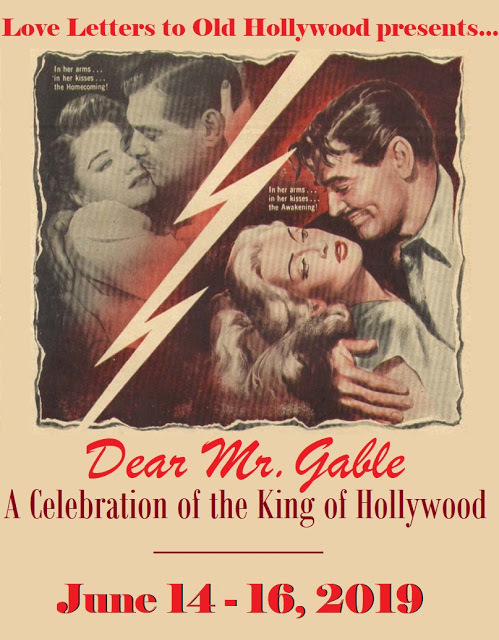 (Some histories suggest that Morrison himself came up with the "John" as a tribute to his friend and mentor, John Ford). 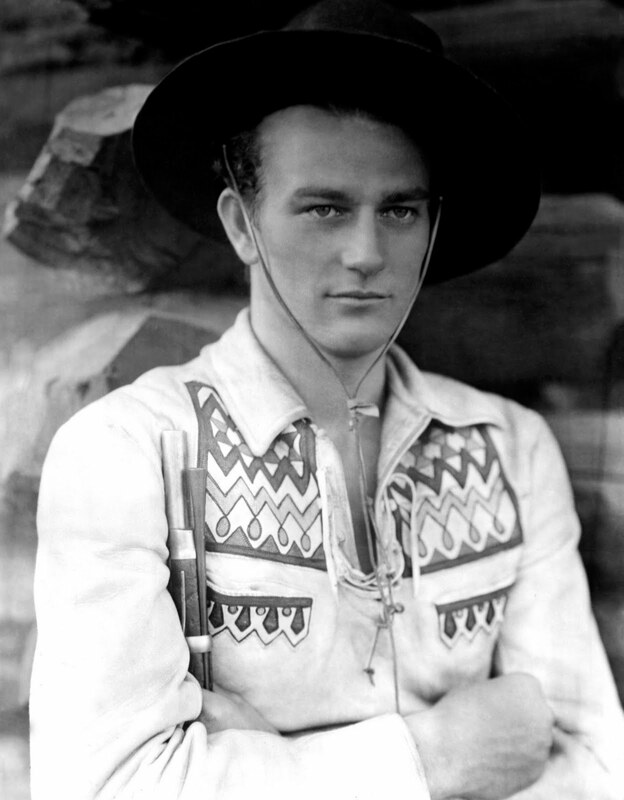 As for the fact that he could not act, a trainer was hired for Morrison, (hereafter referred to as as John Wayne). He was also to be given training on how to do some stunts and such, for which they hired stunt man "Yakima" Canutt, the beginning of another lifelong friendship, and who was an occasional fellow actor. Despite all the help Wayne received, the film was a failure at the box office, and Wayne was sent back to the "B" picture studios. 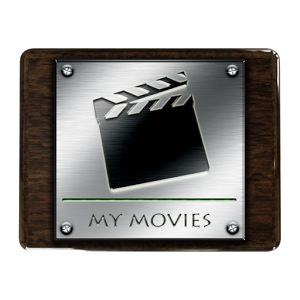 Wayne continued on in this mode for the next 8 years, producing movie after movie which could easily be replaced by one or the other in plot and pacing, many of them less than an hour in length. On one occasion, Wayne was actually cast as a singing cowboy. He couldn't sing. Or play guitar... He was filmed with one person off camera doing the singing and one playing the guitar, while Wayne just went through the motions on camera. He never had to do it again. The studio found an amiable fellow to take the singing cowboy roles, Gene Autry. 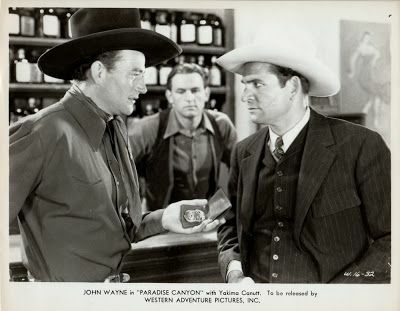 Over that 8 year span, Wayne made some 60 or so cheapies, mostly westerns, and did garner a name for himself. But he struggled to get out of that rut. During this run of his life he made, variously, several remakes of Tom Mix silent movies (Tom Mix being one of his childhood heroes), several in a series known as "The Three Mequiteers" (in which he starred as Stony Brooke, alongside Ray Corrigan and Max Terhune), and a few non-westerns. 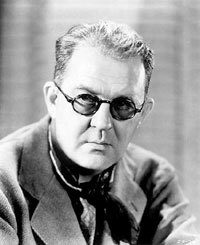 Stardom loomed on the horizon when his friend, director John Ford, decided to cast him in his new production of an Ernest Haycox short story "Stage to Lordsburg", the film adaptation of which was to be eventually called Stagecoach. Ford has been quoted as saying he preferred short stories for adaptation as opposed to novels and in this respect he seems to have found the perfect story. Wayne was tapped to play "The Ringo Kid", a character who became sort of the gold standard of the future Wayne output, a man with standards and a sense of justice, but who may or may not be on the side of the law. "The Ringo Kid", in this case was an escapee from jail, one who, as it turns out, had been framed for murder, and was out to take his revenge upon the men who had framed him. I intend to do a review of Stagecoach in the near future, so I won't go into it in detail for this entry, but suffice to say that Wayne had used the experience he garnered toiling away in the B-movie circuit to garner a name for himself with this movie. Admittedly, he still had a few more years before he could transform that into true stardom, but this proved to be the launching pad for what later became the icon we all know and love. Obviously, this list is incomplete. As stated earlier, Wayne was in some 81 movies before he hit the heights with Stagecoach. Hope you enjoyed this brief biographical interlude. 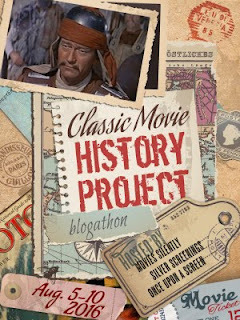 Be sure to tune in on Tuesday for a second entry in this blogathon in which I will discuss John Wayne's most regrettable role, that of Temujin in The Conqueror. All "before they were stars" stories are fascinating, but when someone becomes the icon of a generation it's more so. I read Eyman's Wayne biography as well and loved it. I look forward to your STAGECOACH commentary. 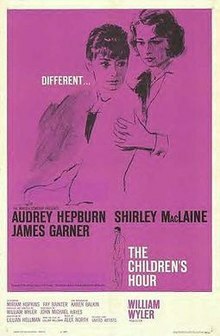 Thanks so much for this entry to the blogathon! "Stagecoach" is probably a month or so down the road. I'm backed up with blogathon commitments at present. Up next is "The Conqueror". Thanks for the good words. It's incredible how raw John Wayne was in "The Big Trail"; awkward on screen, but with a lot of charisma. On the other hand, in a bit part his fellow footballer Ward Bond was as at ease as he would be in a variety of roles through the coming years. It shows that some people "got it" and others have to work at it. I would have been one who had to work at it. I got to some acting in school, but I never was able to turn it into a desire to run off to Hollywood. Thanks for the good words. 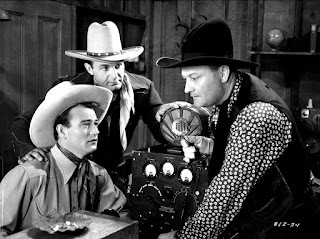 I agree that it was "Stagecoach" that made John Wayne a star. It's that first shot we see of him – heroic, framed by the mountains, singled out by the camera – that tells us there's Something Special about this chap. Great essay! My fave husband recently bought me "John Wayne: the Life and Legend" which I've not yet read, but you've moved it to the top of my Must Read List. Thanks so much for joining the blogathon with this look at Marion Morrison before he became a Star. Good essay about John Wayne. I used to try to catch his early stuff when it would show up on television. It was fun to see him grow. A late show on Friday night ran Shadow of the Eagle and I couldn't believe it was the same guy I went to see in current movies. He WAS handsome. Easy to see why he rose to the top. 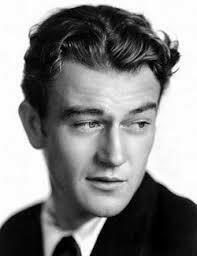 I became a John Wayne fan by osmosis from my maternal grandfather (not heredity, because my mother was adopted). But we used to watch afternoon movies when a Wayne movie came on.